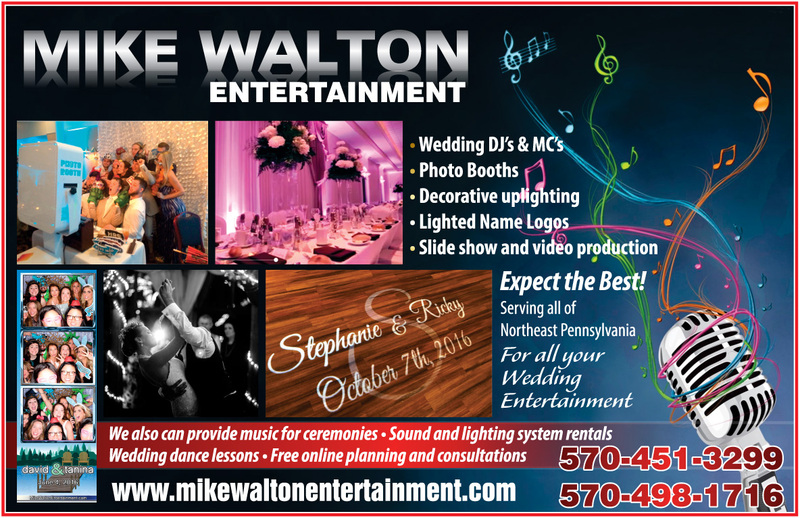 The Wedding Planner Magazine | Mike Walton Productions - Professional DJ Entertainment services located in Old Forge, PA.
All of the DJ’s at Mike Walton Entertainment remain dedicated to providing the most appropriate entertainment for your special day. Whether it is an intimate wedding, children’s parties, family gatherings, nightclubs or sweet sixteen parties, we are the experts. We also perform at large scale corporate events, high school proms and many of our area colleges. Our experienced Disc Jockeys and state of the art audio and lighting equipment promise to make your event fun and memorable. Q. What sets you apart from the competition? A. 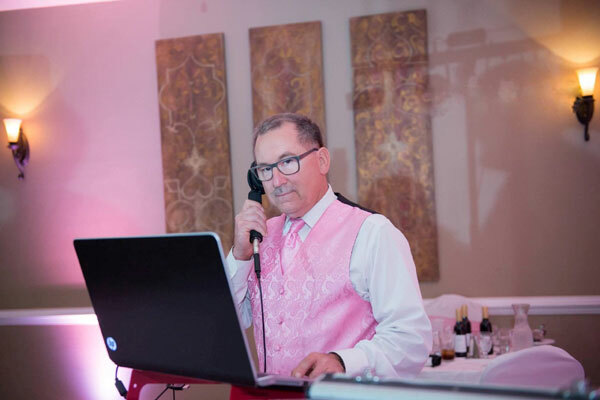 Experience: All of the Entertainers at Mike Walton Entertainment are very experienced in playing for many events including Weddings, Proms, Birthdays, Reunions, Anniversaries and many other events. From knowing what to play and when to play it to helping to keep the event running smoothly and on time, Experience is what can make or break your event. 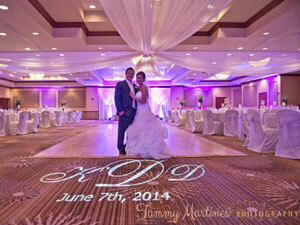 We meet with you and prepare for your event so that it goes perfectly on your special day. We take care of all announcements and work with your other vendors to make your event the best it can be. Q. What is your professional entertainment experience and do you have any extra training? A. As the owner of the company, I have been playing for events in Northeastern Pennsylvania for over 20 years. 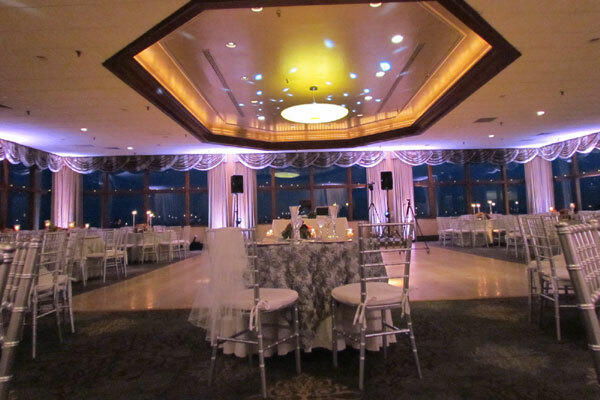 We have also done events in New York City, Philadelphia, Allentown, Atlantic City, Long Island and many other venues in the New York, New Jersey & Pennsylvaina areas. We have done Thousands of Wedding Events but have also performed at Game shows, boxing events, cheer leading competitions, Fundraisers, Bar & Bat – Mitzvahs, Birthday parties, School Dances & Proms, Ballroom Dance Events, all of which helps in making us well versed in many music styles and ethnic traditions. Q. Are there any other services that you provide such as lighting design? A. 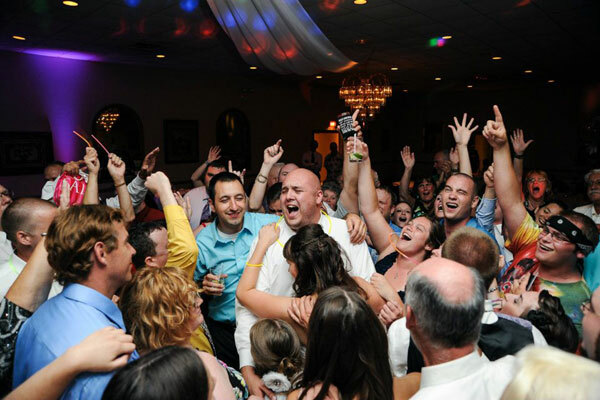 We provide the following but we are not limited to: DJ Service, Photo booths, Room decor Uplighting and Custom lighting design, Lighted Name Gobo Lights, Slideshow & Video Presentation, Professional Sound & Lighting Rentals, Karaoke, Video Music Displays, Trussing Displays, Ballroom Dance Lessons and Choreographed Dance Instruction and much MORE! Q. How extensive is your music library or song list? A. It is unlimited, if the song is out there, we will get it !!! 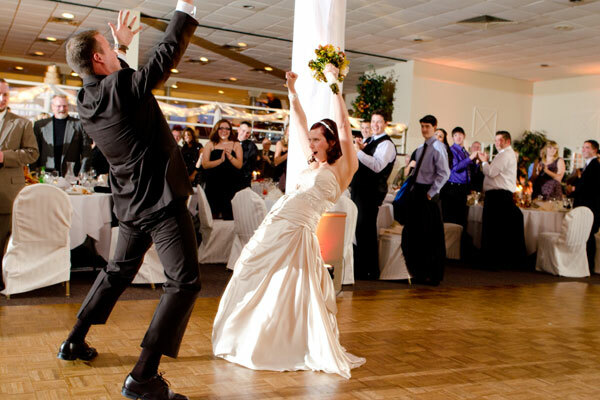 and we have many suggestions on all of the events that take place at a wedding event such as Ceremony Music, Cocktail, Dinner, Introduction, First Dance, Parent Dances, Cake Cutting, Garter/Bouquet, Dollar Dance and More. Q. Are we guaranteed to have the performer that we meet and like at the event? Q. If the scheduled entertainer can’t make it to my wedding do you have a backup plan? A. 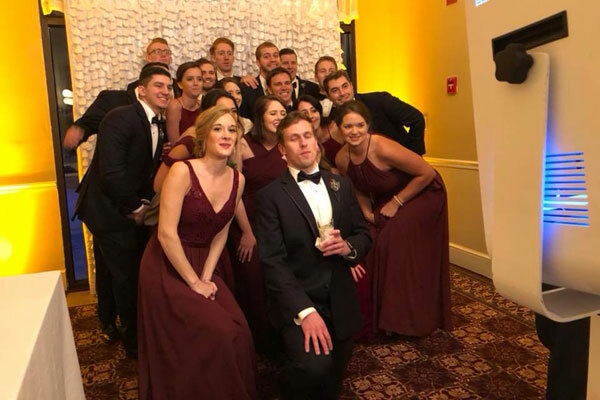 Yes, there are several qualified Entertainers on staff and in the extremely unlikely event that we would not have staff available, we also have great relationships with many of the other entertainers in the area to make sure you are not disappointed on your day. A. Yes, we always have back-up equipment with us and available at our office location. We feature the best equipment in the industry and strive to upgrade on a regular basis. Q. 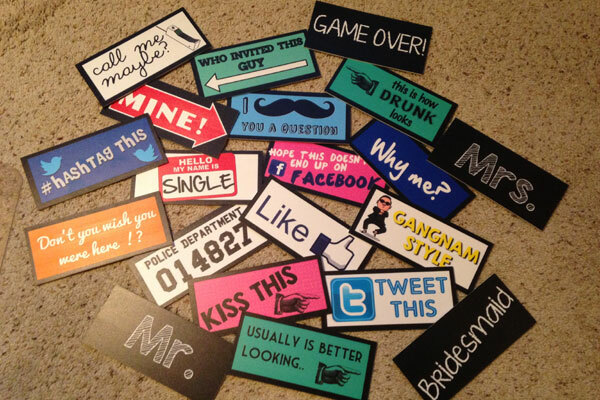 Do you have a video of a prior wedding? A. No, we do however have excellent web presence and great reviews on sites like The Knot & Wedding Wire. You can also see reviews and comments from previous clients on the Mike Walton Productions page on Facebook. We can also put you in touch with a previous client to let you ask them questions personally. Q. Do you carry liability insurance? A. We carry $1,000,000.00 limited liability insurance and can provide you or your venue with a copy of the policy upon request. Q. How will you dress on my wedding day? A. 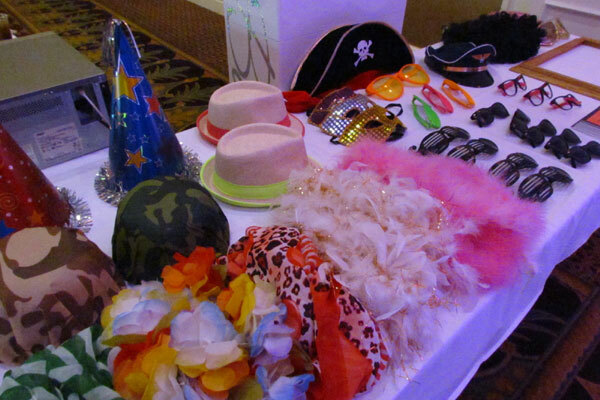 We typically dress in a Tuxedo or Suit & Tie for each event, however, we will dress according to YOUR specifications. I was asked to wear a Hawaiian shirt to a recent wedding. Q. How far in advance do I need to secure your services? A. 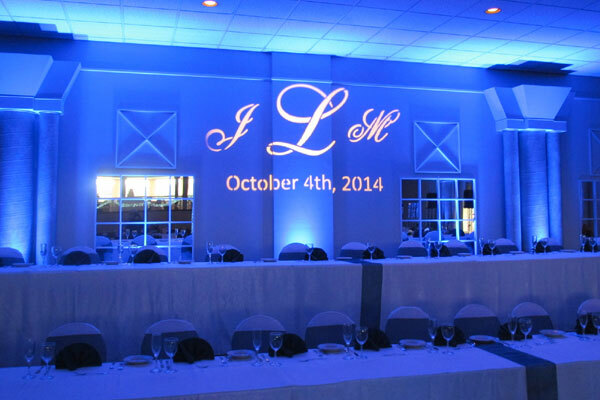 When you have made the decision that you want to hire us for your event, put a retainer down as soon as possible. 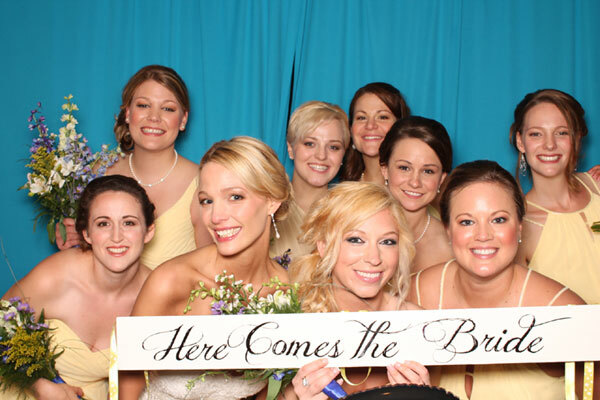 the next bride who is looking at the same date is only a phone call away and we cannot predict when that will happen and we cannot hold the date without a retainer. 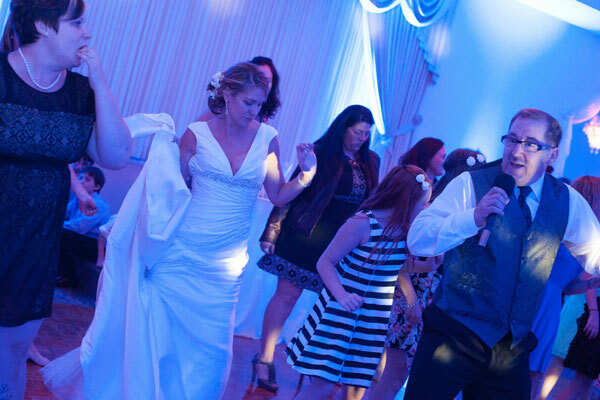 we do recommend that you book your entertainment 12 to 18 months out from your wedding date. Q. If the event lasts longer than scheduled, what are the overtime charges? A. Hourly rates vary per event and they will be quoted to you when you are given your written quote. A. There may be extra charges if your have special requests from us ie: ceremony music, microphones for celebrants, separate sound system for music in another area, etc. Q. When can I expect to receive my contract? A. Your contract will be sent out as soon as we confirm the booking of your engagement. Q. What is your ordering and payment process? A. You will be required to send in a retainer of at least 1/3 of the total for your event. You can make payments anytime before your event and the payment in full is required at least two weeks prior to your event date. Q. What if my wedding date changes? A. In the event you have to switch your date, we will do everything possible to accommodate you to make sure you have a qualified entertainer at your event. If we cannot accommodate you, we will either find you another entertainer or refund your money depending on the situation. Q. What is the cancellation policy? Is the deposit refundable? A. In the event you need to cancel or postpone your event with us, we can try to apply the retainer to a future date, however, the retainer is non-refundable.